In a pot, lightly heat up the ghee, and add in both the flours, and roast on a low flame (stirring intermittently) for about 30-40 minutes, till the flour is roasted evenly and well. This step is the key to perfecting this recipe, so I’ll elaborate and break this down further. First things first, it’s very important to roast the flour on a low flame. Do not increase the flame to speed up the process because that will just result in unevenly roasted flour at best, and burnt flour at worst. Both things you do not want. I would recommend roasting the flour for a solid 30 minutes on low flame, stirring intermittently, and then slightly increasing the flame in the next 10 mins (still medium low) and stirring continuously. The flour is fully roasted when it starts to give off a roasted flour smell (sorry don’t know what else to equate this with 😛 any ideas?) and turns golden, slightly reddish. But here do ensure it doesn’t turn too red or brown, because that means the flour has burnt, and it will spoil the taste of the ladoos. Once this step is done, transfer the roasted flour into a paraat dish (wide flat bottomed steel bowl), and add in the powdered sugar, elaichi powder, and golden raisins. At this stage, considering the flour is still pretty hot, mix in the sugar and the flavorings into the flour using a spoon, so as to not burn your hands. And then set the flour mix aside for about 10-15 minutes, so that it cools down a bit, but not too much. Because you just want to ensure that the flour mix is not too hot to handle, but you don’t want it to be so cold that it won’t bind together to form ladoos. Which is why, it’s best if the flour mix is still really warm, while making ladoos. That being said, before you actually get to making the ladoos, ensure to mix the flour, sugar, and flavorings very well once again by hand, just to ensure it’s all one homogeneous mixture. 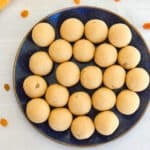 Take a small portion of the flour mix in your palm (how much flour you take will determine the size of your ladoos, no right or wrong here) and press the mixture tightly together, while slowly trying to shape it into small balls. Repeat with the rest of the mixture, and place the ladoos on a serving tray to cool for 5-10 minutes before you serve. This recipe makes 21 mid-sized ladoos. But the number of ladoos any recipe makes will always depend on the size of the ladoos. Some people choose to roast the two flours separately, but ain’t nobody got time for that. 😛 Okay on a more serious note, I have tried both ways, and so long as you roast the flour well, there is no difference in taste. So I’d say just roast the flours together. The wheat flour used in this recipe is chapati flour/wheat flour available in Indian grocery stores, not the whole wheat flour found in supermarkets. I have only added raisins, but feel free to add the dry fruits of your choice. Cashews I know are particularly popular and frequently added in Churmundo.